Decatur CD: Record Store Day is TOMORROW! Sale: Pay attention, because this is how it'll work. Our entire vinyl, DVD and box set selection will all be marked down a whopping 20%! You vinyl nuts will appreciate this, we're sure, especially on the pricier items, but the DVDs and box sets are a big score too. To give you an idea, Perception, the massive box set we stock from The Doors and normally retails at $140 will cost $112 on Saturday. Rockin' Bones, meanwhile, the excellent collection of 1950s punk and rockabilly that is normally priced at $65 will cost you $52 on Saturday. You get the idea. It would be a smart, smart move to ask us for the box set binder (yes, we keep a [fairly] organized, alphabetical list of them all) and have a perusal on Record Store Day. Additionally, we'll be putting a bunch of select CD titles on sale. These will include excellent new releases from R.E.M., The Black Keys, Gnarls Barkley, The B-52s, Daft Punk, Van Morrison, Sun Kilm Moon, The Whigs, Stephen Malkmus, Levon Helm, Shawn Mullins,The Everybodyfields and more. They'll be displayed on their own, separate from other stock and the price slash will be rather immense, so keep an eye out for it. Additionally, several other CDs will be marked down to $5. Deals galore, people! Refreshments: As we told you once already, There Will Be Beer. Unfortunately, we couldn't secure Daniel Day-Lewis to work the cash register. 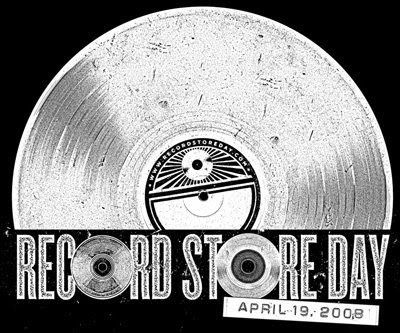 However, in keeping with the line of thinking that Record Store Day promotes, much like we're glad you choose us over the generic, big-box counterparts, we hope you choose to patronize other excellent local businesses like Watershed, Cakes and Ale, Brick Store, Twain's, Little Shop of Stories and so on. We also think life is too short to drink bad beer. As such, we're celebrating the first annual RSD with Allagash, Dogfish Head, Victory and Duck-Rabbit brews. Y'all are better than the cheap stuff, and we're proud to celebrate the finer things with you. From store open until store close (or until we run out), we'll do just that. 21+ only, of course. We'll also be pulling out a variety of Girl Scout cookie boxes for your afternoon snack needs. There will be some of every kind. Yum! Giveaways: There are a couple here that you should take note of. We've got a pair of big giveaways that you can ONLY SIGN UP FOR ON RECORD STORE DAY. First up, the good folks at Tompkins Square are offering up an copy of the Grammy-nominated box set, People Take Warning: Murder Ballads and Disaster Songs, 1913-1938, autographed by the one and only Tom Waits! Cool, right? We'll have a box where you can enter your e-mail address for a chance to win. Next up, we have a framed an autographed litograph of the cover of Feist's The Reminder. It's a beaut, and just like the disaster set, we'll have a box where you can sign up. Don't miss out on these, folks. They are only available on Saturday, and we want you to win, so stop by and enter! Additionally, there is a bunch of other random stuff that we'll have scattered about the store, free for the taking. Buttons from the Deluxe Edition folks, random posters, samplers (from the likes of Vice, Daptone, Atlantic, Fontana, Sub Pop, Koch, Red), stickers, 3-D glasses, signed posters, free vinyl comps with vinyl purchases and much more. The generous folks at Paste have chipped in as well, with around 50 free copies of the Gnarls Barkley issue. However, the catch is that not only is the issue free, but it comes with a "Pay What You Want" subscription coupon. That's right, you get a free issue and then decide how much you want to pay ($1 or more) for a full year's worth of Paste. Quite a deal, no? But the magazines, just like everything else, are while supplies last. Get 'em while the gettin's good! Now, these are all limited edition (which means they will be out of print soon), and we only have a certain amount of each, AND they were made specifically for Record Store Day. This means you should show up early and buy them up. They will be collector's items someday, folks. Good stuff all around, and you won't find them anywhere else except official Record Store Day stores. That's about it. We can't stress this enough: Come out on Saturday and show your love for independent retail. We love it, you love it, let's share the love. "Yes, yes, I know. It's easier to download music, and probably cheaper. But what's playing on your favourite download store when you walk into it? Nothing, that's what. Who are you going to meet in there? Nobody. Where are the notice boards offering flatshares and vacant slots in bands destined for superstardom? Who's going to tell you to stop listening to that and start listening to this? Go ahead and save yourself a couple of quid. The saving will cost you a career, a set of cool friends, musical taste and, eventually, your soul. Record stores can't save your life. But they can give you a better one." Gnarls Barkley is in the house.